If there’s one show that’s I’m dying to see return to the air ASAP – it’s The Walking Dead. I feel like the show is ALWAYS on hiatus. First fans had to endure the longggg break after a 6-episode season (as if that wasn’t upsetting enough); we were treated to an amazing return to only have the show go back on ‘a break’. I say WTF! There’s been plenty of breaks already – bring back my ranger Rick please. I’ll even take Shane, albeit I’m not overly thrilled with the direction in which his character is going. Nonetheless, the wait is almost over. Last night AMC previewed a clip of what fans can expect for the February 12 return. After the long mid-season break, finally we get some insight into our fave character’s lives – or deaths. The upcoming episode, entitled “Nebraska”, introduces 2 new characters. Something tells me that a whole new gaggle of folks are to be expected – it is after all a zombie apocalypse. 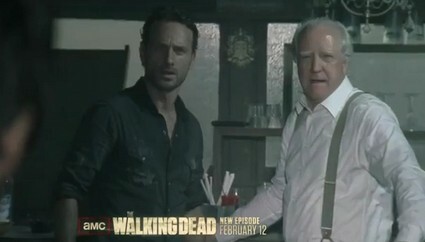 So enter these 2 new fella’s after Rick is trying to talk some sense into Hershel – who appears to be drowning his sorrows in booze. Who are they and where did they come from? Ayayay – I suppose we’ll find out soon enough… check out the clip for yourself. It’s short, but it’s something!